Severn Trent, South West Water and United Utilities are set to benefit from “financial and reputational” benefits after receiving “limited interventions” to their proposed business plans for 2020-25. Ofwat has published its draft determinations for the three fast track companies today (11 April) and praised the companies for setting a “new standard” for the sector. The regulator suggests the companies have set an example to other water companies that affordable bills can be delivered for customers while investment can be made in service and infrastructure. According to Ofwat, 7.9 million households in the North West, South West and Midlands could see their water bills fall by as much as £70 before inflation by 2025. The bill reductions in Ofwat’s early draft determinations are: Severn Trent £16, United Utilities £49, South West Water £77. These are the differences between projected 2019-20 and 2024-25 bills in 2017-18 prices. 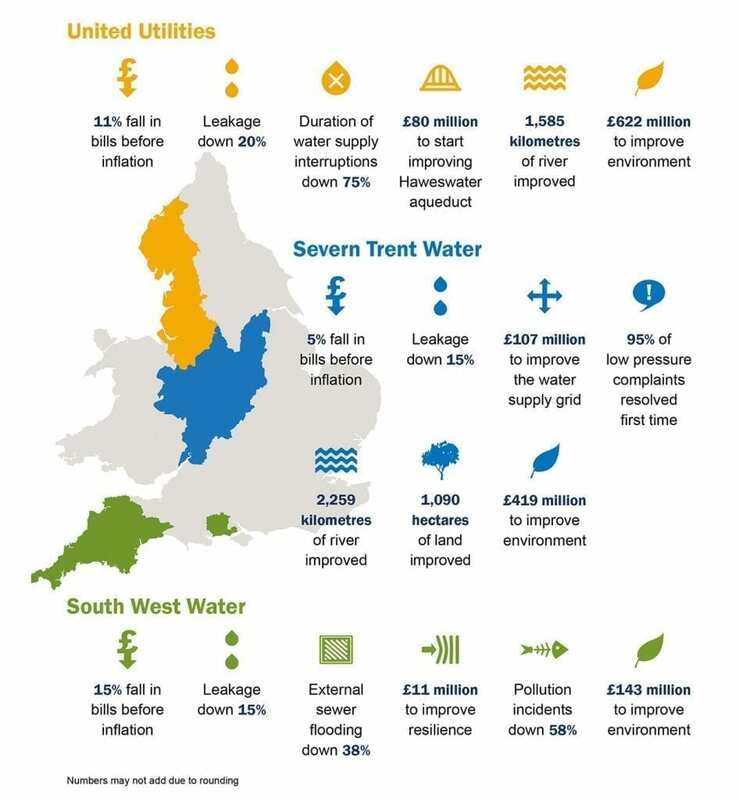 The draft decisions for Severn Trent, South West Water and United Utilities will also mean the companies will spend £1.2 billion on improving the environment to reduce pollution and clean 4,500km of rivers. Ofwat also highlighted investment in infrastructure such as £80 million to start improving the Haweswater aqueduct serving Manchester and the Pennines. David Black, Ofwat senior director, said: “We’ve been very clear that we expect water companies to deliver for customers and the environment and that companies can secure both of these outcomes. Severn Trent, South West Water and United Utilities all stepped up to the mark with their plans. By 2025, the three companies would need to cut leakage by at least 15 per cent and provide help for 300,000 customers struggling to pay. The companies impressed Ofwat by demonstrating ways to become more efficient and embrace innovation. The fast track companies will make representations on their draft determinations by 24 May. Water watchdog, the Consumer Council for Water (CCWater) said it will carry out research with customers to see if they think the regulator’s proposals are acceptable. It plans to use the findings to “influence” Ofwat’s final decisions on company price limits, service commitments and investment in December 2019. Tony Smith, chief executive of the Consumer Council for Water, said: “Customers should be the judge of whether these proposals are acceptable which is why we’ll be asking households to give us their verdict – if they don’t like what they see, we expect the regulator to make changes. At the start of this month, the remaining companies in the slow track and significant scrutiny categories resubmitted their PR19 plans to Ofwat. The regulator will publish draft determinations for the other 14 water companies in England and Wales on 18 July.